Russian rule has been deadly for some of Crimea’s addicts. Russian rule has cut Crimea’s drug addicts off from the treatments they depend on, with sometimes deadly results. 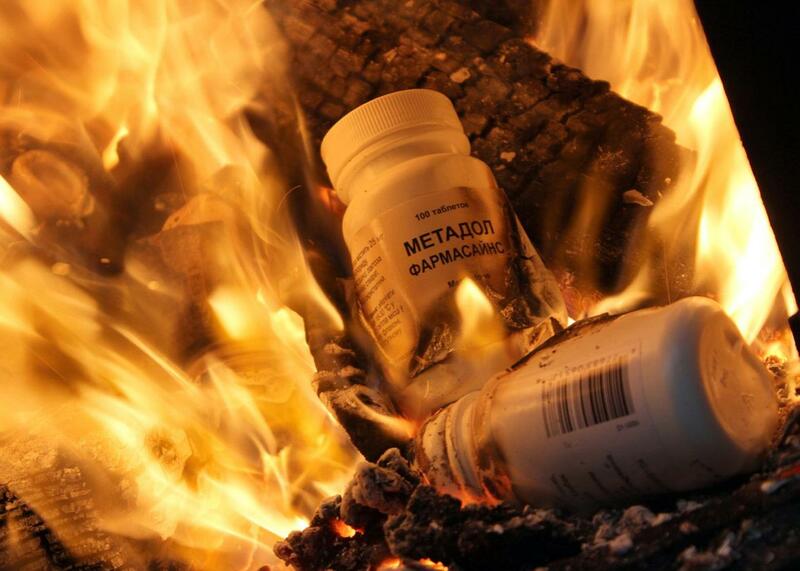 Bottles of synthetic opioid methadone are destroyed by Russian drug officers in Simferopol in 2014. When Ruslan disappeared unexpectedly from his hometown of Yalta, Crimea, in May 2014, his neighbors soon decided they knew where he had gone. Crimea had just been annexed from Ukraine by Russia, and the atmosphere was heady with passion, rumor, and propaganda. Ruslan, then 40, had served time in prison for drugs before becoming a civil society activist. A well-known thorn in the side of the local police, he had not been supportive of the Russian annexation. He must, people said, have gone to join the Ukrainian army battling Russian-backed separatists in eastern Ukraine. Ruslan had indeed gone to mainland Ukraine but for a different reason. On May 20, 2014, doctors had distributed the last doses of methadone to over 100 patients in Yalta, as Russia raced to shut down a Ukrainian substitution therapy, or ST, program for long-term opioid drug users in Crimea. Ruslan was one of them. He took the train to Kiev that night to continue the therapy there. Hopes among remaining patients that the new Russian authorities would relent and reinstate the program, or provide promised free detoxification to alleviate withdrawal symptoms, soon evaporated. When Ruslan came back to Crimea in December 2014, the new Russian authorities were publicly burning leftover stocks of methadone, and Ruslan’s community of friends, activists, and ST patients had vanished. Many fellow patients were dead or dying. Ruslan himself ended up passing out outside the hospital after, he says, police came to his home and deliberately burned his hand with boiling water. Russia’s abrupt, highly public shutdown of substitution therapy in Crimea in 2014 is one of the oddest and cruellest stories of the annexation. Russia claimed it incorporated the peninsula to protect local Russian-speakers from what it called a nationalist, fascist government that had come to power after months of demonstrations in Kiev forced President Viktor Yanukovych to flee. What did 800 patients on a medical program used globally to reduce health and social problems associated with long-term drug use have to do with that goal? The answer goes back to the collapse of the Soviet Union. Ruslan was nearing 20 at the time, and injected opioid drug use was flooding newly independent Ukraine and Russia. The state response was repression and punishment, filling jails with users while corrupt law enforcement often protected dealers for kickbacks or were themselves in on the trade. In both Ukraine and Russia, the injected drug epidemic was quickly followed by the largest, fastest-growing HIV epidemic in the Eurasian region, which continues to grow. Russia last year reached an estimated 1 percent infection rate among the general population, with a million registered cases. But from the late 2000s, the two countries’ approach to the twin epidemics, as to much else, began to differ. Ukraine adopted harm reduction models like those used in Europe, introducing street programs offering drug users clean needles, condoms, and access to health and social services. Meanwhile, community and nongovernment organizations lobbied to soften both drug laws and social attitudes that painted drug users as criminals and outcasts. Substitution therapy, introduced in Ukraine in 2004, was key to removing stigma associated with chronic drug use: Receiving a daily substitute (methadone or buprenorphine) under medical control meant people could not only receive regular health monitoring and care but also stabilize their lives, holding down jobs and rebuilding social ties. By 2013, there were more than 8,000 people receiving ST nationwide. Russia took the opposite path. An increasingly authoritarian, conservative government suspicious of civic initiatives (often funded by international aid) began to restrict harm reduction programs and closely monitor and hinder implementing nongovernment organizations by dubbing them “foreign agents.” Any discussion of ST in Russia or worldwide—it is backed by the World Health Organization and the Joint United Nations Programme on HIV and AIDS as part of a complex of measures against HIV—was rejected in favor of an insistence on abstinence-based rehabilitation. 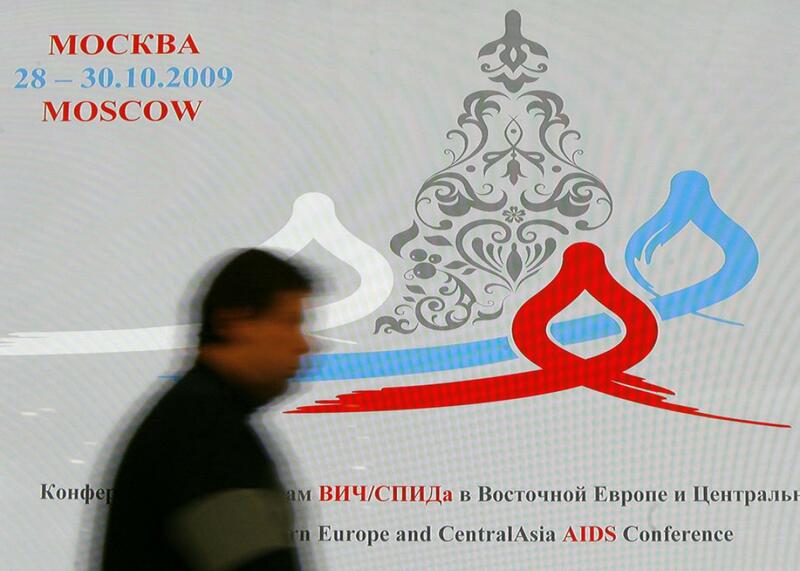 A man passes by an official logotype of the AIDS conference, displayed on an electric board, in Moscow in 2009. The drug crisis in Crimea has caused HIV rates to rise. Russia’s campaign against substitution therapy is deeply rooted in an ideology of abstinence, which marries the Soviet science of “narcology” with a current focus on so-called family values, pitting them against the perceived corruption of Western liberal influence. In the view of the Russian drug control agency the Federal Drug Control Service of the Russian Federation, or FSKN, substitution therapy not only fails to cure people addicted to drugs: It actively seeks to kill them by getting them addicted to the more harmful methadone, which is being dumped on poorer countries by Western pharma companies seeking a quick profit. After demonstrations in Ukraine from 2013 to 2014 calling for an end to state corruption and more civil freedom and rule of law, drugs and civil unrest became strangely intermixed in the eyes of neighboring Russia. The head of the FSKN claimed that the Ukrainian demonstrations, like the recent revolutions that had swept other post-Soviet and Arab states, had been fueled by methadone, psychotropic drugs, and foreign money. In that case, drugs and substitution therapy were not only a threat to Russia’s family values. They were a direct, Western-sponsored attack on the state. In that light, the immediate shutdown of the ST program in Crimea after the annexation takes on a kind of logic, as does Ruslan’s neighbors’ conviction that he had gone to fight for the Ukrainian army. ST in Crimea was indeed more than a medical intervention. It was a social one, encouraging patients to build communities and become activists challenging the state structures that had traditionally repressed them. Skala has a collection of photographs from September 2012 in Yalta, at an APH-organized advocacy summer school for ST patients from all over Ukraine. The smiling, suntanned participants joined sessions on team-building and learned how to collectively protect and promote the rights of patients and drug users to humane medical and social treatment, including ST.
Ruslan believes this previous activism marked him out for close attention since he came off methadone over the course of a year in Kiev and returned to Crimea at the end of 2014 to look after his elderly mother. There are still bizarre anti-Ukrainian messages chalked on the wall outside his dark, tidy, old-fashioned apartment, and the lock on the door is still broken since the police visited at the end of 2014 and he ended up in hospital. He doesn’t use the internet and sticks to the simplest mobile phone: “like living in a cave,” as he describes it. In late 2016 he found a job on a building site—illegally, as he doesn’t have a Russian passport—but left after three months when he wasn’t paid. He has hepatitis, for which treatment is prohibitively expensive and inaccessible in Crimea without a Russian passport and health insurance. It might be easy to assume that Ruslan’s extreme gloom and paranoia is drug-influenced. But stories like his are not unique in Crimea and not confined to current or former drug users accustomed to a precarious existence on society’s margins. Doctors and social workers who used to work on the ST program are now afraid to admit they were ever involved. In May 2014, staff of one ST site was banned from talking to journalists; even in late 2016, none were willing to speak on the record, even anonymously. That’s not all: Medics have been pressured to publicly denounce their “mistaken” work; doctors found their names on the bottom of supposedly scientific papers in Russian journals condemning ST. I ask Ruslan why he had agreed to talk to me about the substitution therapy program, when he was so afraid of further retribution from law enforcement that he scarcely went outside. 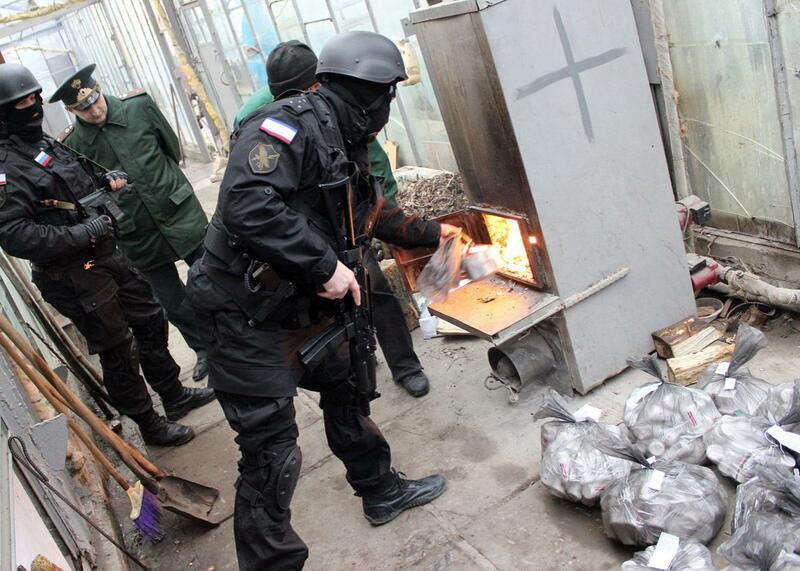 Russian drug control officers burn bags of synthetic opioid methadone during an operation in Simferopol on Dec. 23, 2014. A handful of patients went to Russia for rehabilitation, having received fast-tracked Russian passports. Anton, a patient from Simferopol, died in St. Petersburg of an overdose in the summer of 2014, after the rehabilitation course there failed to halt his drug use. Ruslan told me about several patients from the program who had died in the Yalta hospital from illness, drink, or drugs. And Olga’s son Andrey died of liver failure at home in Feodosia on May 25, 2014, five days after the last dose of methadone was given out. Even before that, another patient in a nearby village killed himself. “They were dying in swaths,” Olga says. The Russian FSKN was dissolved in 2016. But its theories about the evils of substitution therapy are still aired by Russian media, often accompanied with horrifying images of corpses and intoxicated youngsters. And three years of annexation has rammed the message home even among parents in Crimea whose children used ST. It was alcohol that killed Andrey; he had begun waking his mother at 5 a.m. to go and buy him vodka to alleviate unbearable withdrawal symptoms brought on by rapid unplanned reduction of the substitution dosage. During his two years on methadone, Andrey had stopped asking her for money for drugs, Olga says, and started to lead a more settled life. But she never lost hope that he would give up drug use altogether: After all, he had managed to quit a couple of times before, before relapsing. Methadone, she believes, prevented him from being cured. The forced abstinence caused by interruption of the Crimean ST program did not lead to many “cures.” The vast majority of ex-patients either began drinking or returned to street drugs. Spray-painted adverts for the artificial cathinone salt (referred to as “bath salts” in the United States) are indeed everywhere on walls and pavements in today’s Crimea. Via the advertised websites, users can pay using cash terminal and pick the stuff up at locations around town. Quick, cheap, and anonymous, it’s a long way from the 1990s drug dens Olga remembers. Yury, like Ruslan and about 60 others, initially went to Kiev to continue ST, under an emergency APH program for patients from Crimea (and, later, east Ukraine after ST programs there were also shut down by Russian-supported separatist regimes). At first there was funding for housing and food, but when that ran out, Yury returned home. There he signed up at a rehabilitation center, at 25,000 rubles ($440 USD) a month, a hefty sum when his mother had lost her job post-annexation because her accountancy qualifications were not valid in Russia. Yury quit the center after two months. He’s been in hospital twice for detox; a third time, he was told there were no beds. HIV rates rose by about 12 percent in Crimea in 2016, to more than 24,000 cases (in a population of about 2.2 million), according to the Russian state agency Rospotrebnadzor. And instead of a substitution therapy community, which saw many friendships, marriages, and births, drug users are once again social outcasts.